Brooklyn start-up Prosper Gowork leads the way with $99/month all-inclusive memberships, and new locations. NEW YORK – Freelancers and location-independent professionals in New York can now cut the commute and head to beautiful shared workspaces in their neighborhood for the cost of a daily latte. Prosper Gowork has opened two locations in Brooklyn this year – on the Bushwick-Bed-Stuy border and in Crown Heights – with more on the way. 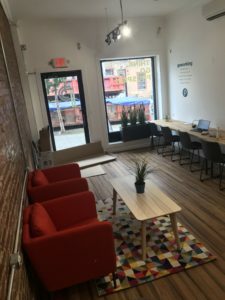 Founder and president Elena Drakos, of Brooklyn, says the affordable model was born out of her own frustrations with expensive coworking spaces that were all about the perks, but did not meet her needs as a small business owner and mother. One of her biggest struggles was finding a quiet place to take calls and a reliable place to meet clients. Cafes were too noisy and crowded. Home was too distracting and unprofessional. “I saw a need to help the city’s growing population of mobile professionals waste less time and spend less money to get more great work done,” Drakos says. 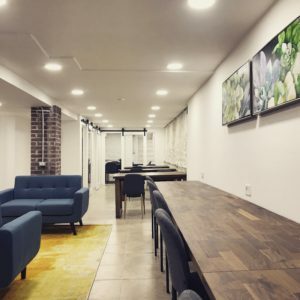 Prosper Gowork’s spaces are fitted out with plenty of private phone booths, meeting rooms and a conference room, which can be booked for no additional fee. There is a yard, quiet space, free coffee and light kitchen facilities. Members can also take advantage of Prosper’s partnerships with TriNet, offering affordable insurance and 401k plans, bookkeeping services through Paro and deals at local restaurants. All locations are convenient to main subway and bus routes to make getting into Manhattan for meetings, or fitting a bit of desk-time in between errands, easy. There is no limit to how often members use the space, as they receive 24/7 access via a secure code, which Drakos says is great for those working across time-zones. “We really just want to offer everything you need, and nothing you don’t,” she says. Prosper has its sights set on transforming more empty street-level retail sites into workspaces that will support the city’s huge community of freelancers and mobile professionals. The first Prosper Gowork location opened in February at 1024 Broadway (on the Bushwick-Bed-Stuy border), right off the JMZ subway line. The newest location at 230 Rogers Avenue, Crown Heights, is a block from the 2 and 5 trains.